They’ve been having such a rough time of late. It’s like we’re suddenly living in an alternate universe where Google and Samsung are the kings of tech innovation. Not that Google hasn’t been a force for innovation for quite some time. But their wearable Google Glass is really making headlines these days. Soon, everyone may be walking around wearing eyeglasses that make Star Trek’s Geordi La Forge visor look like a clunky carburetor. And Samsung’s Galaxy smartphone juggernaut has been stealing the spotlight from the iPhone. When was the last time Apple wowed the world with a new product? Suddenly Apple is so yesterday. Their stock price has tanked. As a typical consumer, I’m happy using their current tech line up. I don’t always need the next best thing to integrate into my fragile home tech ecosystem. So I don’t mind if Apple takes a little time with its next product launch. It’s not like they’ve ever been like… say… Casio. That company has thrown lots of spaghetti against the wall over the decades to see what sticks. Yes, I’ve been watching… their watches. I’ve been a Casio watch man my entire adult life. I bought my first digital wonder watch back in 1980 when I was in high school. I remember how cool it was having a built-in stop watch and countdown timer on my wrist for critical moments… like when I needed to take a catnap in the library before pulling an all nighter to finish the big term paper. Casio watches were never that expensive, and their bands wore out long before the guts of the watch. Replacement wristbands were never as stylish as the original…so I found myself upgrading to the next model watch every two years or so. You pressed your watch against the phone receiver, and the Casio emitted a fast sequence of tones to trick your phone into thinking you’d dialed the number! Thank you, Mr. Bond! You would never have an excuse be late ever again! Eco friendly… But I got tired holding my wrist up to the sun every chance I got to feed my hungry watch! All right. Some of their ideas were more cool than practical. Others were just down dorky. But remember, a lot of this was happening while Apple was in it’s own pre 21st century doghouse. Today, my iPhone has largely taken over everything my Casio watches had ever hoped to do. No, your watch is not atomic, but it does connect to the atomic time calibration signal transmitted in Fort Collins, CO. 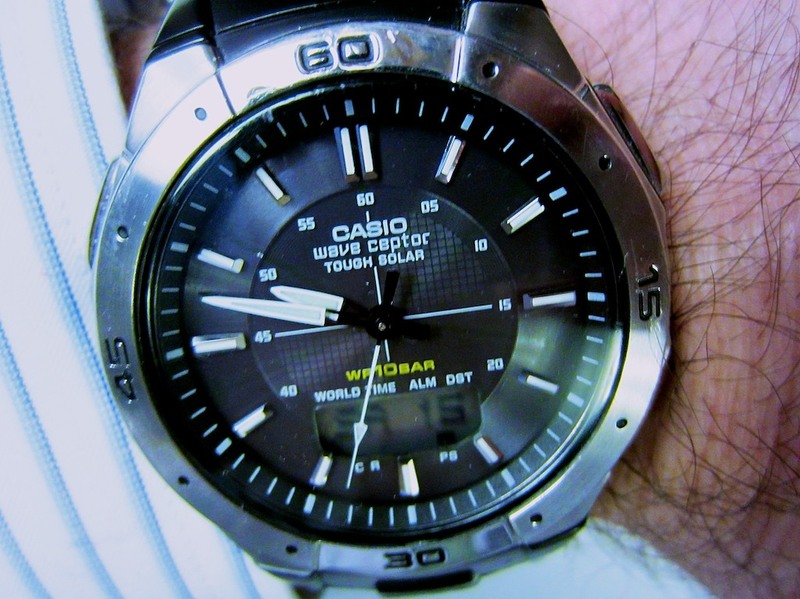 So theoretically, your Casio watch is always exactly on time. You never have reset your watch ever again! But last week, when we passed into daylight savings time, my trusty Casio failed to get the message. It didn’t spring ahead. And then I had to figure out how to trick it to move forward manually. Those four buttons on the side of the watch can activate about 3200 setting adjustments. Unfortunately, changing the time isn’t among the first 700 or so! The only task I demand of my Casio watch is to simply tell me exactly what time it is. And at least twice a year, it can’t do that. Plus it’s hard to see what time it is in the dark. The old glow tech from the 20th century just doesn’t cut it anymore. Anyone else want to strap some tech to my wrist? Wearable technology is today’s new tech frontier. The rumors are flying that Apple’s working on their iWatch. Apple Insider has uncovered some exciting Apple Flex Tech patent filings. Not that any of this is proof, but you might be slapping on your flexible touchscreen smartwatch sometime soon! Whether it’s really a smartwatch or just a tethered ‘slap wrap’ display to your other Apple tech, it’s hard to really know. But whatever it is, I want it! I’ve grown accustomed to wearing tech on my wrist. Casio isn’t cutting it anymore. They’ve had three decades to get it right. Apple is really good at taking existing tech that’s rough around the edges and perfecting the user experience. And sometimes that takes a little time. Just don’t take too long, or I might be wearing my new smartwatch on my head in my glasses! !